<— BLURB-JOLT ALERT! Yep. This one had an excellent, intriguing blurb (I could just feel the addiction in her voice, and knew I was in for trouble) but I one-clicked it as soon as I started seeing comments about how incredibly romantically angsty this one was. To the levels of Thoughtless, even (<— I already “got” what that meant) and I could NOT resist. My fellow readers were discussing amongst themselves (on the blog, and in my newsfeed) how they were in an ultimate fog after this one, and could not put it down, and how it twisted their insides the whole time. Oooooh yes. I was prepared for the book-heartache-ride of my life, and so excited! Lisa: I’m about 45% into A Love Letter To Whiskey. I had to force myself to stop reading, cuz I was having major angst issues. I really really really like this book!!! If only people would use their damn words and communicate – but that would wipe out about 80% of the books I love!!! Nay: My favorite October read was also “A Love Letter to Whiskey” by Kandi Steiner. I think it’ll also end of being one of my top 5 for 2016. Major tummy-twisting angst! … The gut-wrenching feelings it gave me reminded me of what I felt when I read Thoughtless, and I haven’t had a book do that to me in a long time. So if you enjoyed the angst of Thoughtless, you might want to give it a try! Ana: I finished this days ago and I still can’t stop thinking about it! Loved it! Sasha: I loved this book so hard! I couldn’t read anything else for days. I knew it was a bad idea. There wasn’t just a red flag, there was a warning bell and alarms and whistles and neon lights with DON’T DO IT in all capital letters. But sometimes, even when we know something is bad for us, we do it anyway. Maybe for the thrill, maybe to cure our curiosity, or maybe just to lie to ourselves a little longer. In fact, no matter the valid reason for “circumstance” (and sometimes… not so valid <— yes I eyerolled) their desire for each other was a blazing force, scorching everything (and everyone) in their way. One was fuel to the other’s fire, and together, they were a searing mess. Adulting was hard for these two. 😉 LOL!! I love using the word adulting. Not so sure I love actual “adulting” though, sometimes, so I got them. For the most part. Jamie and B meet in high school (by accident). He ran into her and she falls. Quite literally. Just LOOKING at him has her heart racing, while her best friend yells at him for not being more careful… and then he looks at her friend. And the lifetime of emotional turmoil starts! Because even as the two settle into an amazing, true (and maybe even BEST) friendship, while he dates her best friend, the attraction is always there, simmering on the back burner. Threatening to spill over. And spill (and burn!) it does. …as we all learn at a young age, what goes up, must come down. And oh how we crashed. From teenagers, to college students, to adulthood, these two are constantly connected, and yet tearing each other apart. That’s where I’m going to leave this. The rest of their love story is yours to discover. Well written, quite clever in its whiskey and addiction analogies, and loaded in gut-punching moments that will infuriate you. Selfish decisions, life events, and lack of communication (<— and at times, the lack of communication was over the top) is what keeps these two main characters in constant confusion. ..sometimes we say things we don’t mean. We may mean them in the moment the words leave our lips, but as time goes on, good intentions get rubbed raw by failed expectations. Those on the promising end forget why they promised at all, hearts jaded — for good reason. I enjoyed it, however a few situations that kept these two apart, to me? Were a stretch. A stretch enough that by the last quarter, I was exasperated and ready for this tale to come to an end (happy ending be damned!). LOL!!! I was selfish. I was so f**king selfish. Does it have an HEA? My lips are sealed. 😉 You know me. The fun is in the anxiety of not knowing WHERE it’s going. The unpredictability of it all. And while some parts of the story were a bit predictable and excessive, for the most part, this one kept me on my toes! And yes, I agree with many reviews… the ending could have used a bit more oomph, and emotional detail, considering everything we had just been through. 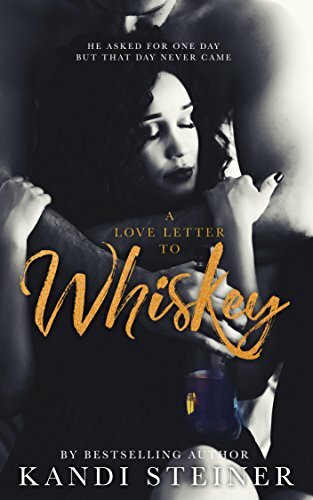 Cheryl: I read A Love Letter to Whiskey. I didn’t love it, think I gave it 3 stars, although I can’t remember a lot about it. Wanted to strangle the h-young and stupid and yes they consistently had poor communication. Great writing, and I loved that it was just ONE POV (and that of the heroine’s, no less, which is my favorite). I LOVE being the main character, because I can feel it all that much more. AND I really appreciated that this author did not pull any punches (YIKES!!!!!) however some of the miscommunication (and consequences due to that) could have had better… “reasoning”. At one point I was just so furious (wondering how the author could expect us to “go with it”) and that may have been where I gave up a little. I also didn’t find myself as “in love” with the hero as I like to be, when reading this genre. Perhaps not enough time spent through her eyes, falling so uncontrollably in love with him? I dunno, but I didn’t feel that ache the way I wanted to. I just wasn’t that attached. That said, if you’re in the mood for a stormy love affair, can suspend belief for some of the “crazy”, and don’t mind it “going there” (by way of OH NO THEY DIDN’T!!! ), then this one might be for you!!! Great review as always, Maryse. I’m at about 75%, and I totally get the same vibe as you so far…but then I remember back to “bad timing and circumstances” in my past, and I get all teary eyed and choked up, and it makes my heart hurt. It’s true, Lisa, that there are VERY realistic circumstances that can keep two people in love, apart. I wholeheartedly agree. Great review Maryse. That answers all the questions I had about it! I definitely agree with your review..When you mentioned some said it had the Thoughtless vibe, I had to read it. I was a little discussion…Good book but not Thoughtless like…At least not to me. Totally agree with your great review Maryse!! Er… I dunno. I’d almost say… one that enjoys drinking daily and even has developed whisky taste-buds (and wine).